Arty, tatty, folksy and refreshingly credible, The Hobgoblin swallows neat and polished, chews them up and spits out something insouciant, real and honest. 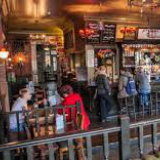 The Hobgoblin is homely and unpretentious, with lots of wood, brickwork and paisley, plenty of paintings, an abundance of revelry and the Troll’s Pantry kitchen is just to die for! However, the real gem here is outside. From delightfully tatty vintage furniture and a retro pinball machine, the Hobgoblin reigns in quirky boozer supreme. However, summer days belong to their graffiti and art clad beer garden where burgers and fun DJ nights unite.